"Caramel that can be made into hard candy for caramel apples or small bite size pieces, soft caramel for making chocolate covered caramel candy or even softer for a dipping sauce for fruit or ice cream substitutes. For caramel dip cook mixture to 225 F."
In a heavy bottomed saucepan, combine sugar, corn syrup, salt and 1 cup non-dairy creamer. Heat to between 234 and 240 degrees F (112 to 116 degrees C), or until a small amount of syrup dropped into cold water forms a soft ball that flattens when removed from the water and placed on a flat surface. Combine vanilla and remaining creamer and stir, a little at a time, into caramel. 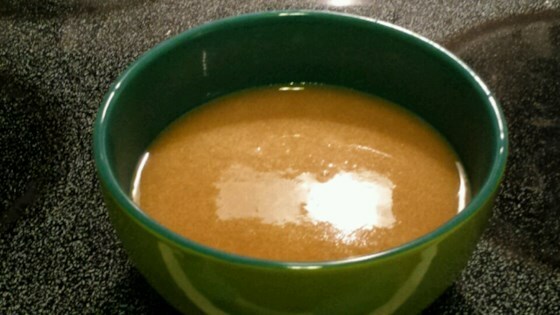 For a soft caramel, remove from heat and pour into a buttered 8x8 inch dish. For a hard candy or caramel apple coating, continue cooking until mixture reaches hard ball stage, 250 to 265 degrees F (121 to 129 degrees C), or until a small amount of syrup dropped into cold water forms a rigid ball. These dark chocolate coins are the currency of pure deliciousness. Excellent! Being lactose intollerant, I cannot have the caramel that is sold in the stores. There is very little difference between this recipe and the store bought caramel. its great! and you can buy chocolate biscuits to dip it in. It helps you to relax and is great for coffee and biscuits. Much easier than other recipes. Thank you!